Catalina State Park covers a small area of the northwestern foothills of the Santa Catalina Mountains near Tucson, where the landscape is typical of the upper Sonoran Desert, with dry washes, canyons, rocky outcrops and sandy flats, together with a varied mix of bushes, trees (along the streamways), wildflowers and cacti. Facilities comprise a campground, equestrian center, picnic areas and short trails, three of which link with longer routes higher into the mountains, through the adjacent Coronado National Forest. The land rises steeply to the east, from around 2,800 feet to the summit of Mount Lemmon (9,157 feet) just seven miles distant, and the park is high enough for good views westwards, towards the Tortolita Mountains and Avra Valley. Catalina is a popular location, both for camping and other activities, partly because the park borders the expanding residential neighborhood of Oro Valley, and is just a short drive from downtown Tucson, like the other main foothills recreation area (Sabino Canyon, which is just a little more spectacular). The park is also quite similar to Lost Dutchman State Park near Phoenix - both contain land that is no different to the undeveloped desert nearby, but offer the chance to explore with the benefits of facilities and maintained trails. 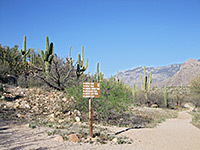 The entrance to Catalina State Park is just off busy Highway 77, in a built-up area of malls, superstores, restaurants and housing estates, but the landscape is completely natural once past the entrance station (fees $7 in 2016), after which the road passes a turn-off for the campground and horse center, then another for the group area, before ending at the main trailhead parking, complete with a small, seasonal store that sells drinks and snacks. The surroundings are partly shaded by large cottonwood trees and clumps of bushes, beside a sizeable streamway (Sutherland Wash), which is dry in summer. Apart from the 0.7 mile Romero Ruin Trail (to the remains of a 1,500 year old Hohokam village) and the little used, 7 mile 50-Year Trail that leads into national forest land to the northeast, all paths begin from the trailhead at the end of the road. The one mile (loop) Birding Trail climbs through a partly overgrown region around the junction of two dry washes, good habitat for birds, especially in early summer; over 150 species have been observed in the locality. 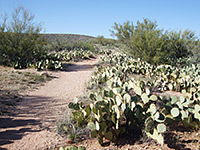 The Nature Trail, also one mile, leads up a short, steep slope on the north side of Sutherland Wash to the flat, open plateau beyond, then begins a short loop. Notices along the way describe typical flora and fauna of the Sonoran Desert; the most prominent plants hereabouts are mesquite, acacia, palo verde, ocotillo, yucca (soaptree and Schott's), agave chrysantha, nolina, sotol and cacti, including saguaro, echinocereus fasciculatus, mammillaria grahamii, ferocactus wislizenii, opuntia phaeacantha and six species of cholla. 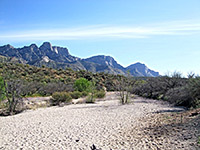 The Nature Trail also gives a fine, unobscured, panoramic view of the Santa Catalina Mountains to the east. 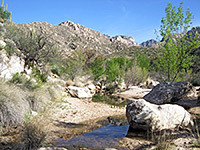 The most popular route in Catalina State Park is the 2.3 mile Canyon Loop Trail, usually hiked anticlockwise. The path heads through a grove of bushes, over the wide sandy bed of Sutherland Wash and quite steeply up the far side to a flat area with a few cactus species, though no saguaro. The Romero Canyon Trail forks east after 0.6 miles, linking with other paths high in the Coronado National Forest, and passing one day hike location after 2.3 miles (Romero Pools, a collection of seasonal water tanks). The loop trail continues to a viewpoint of Sutherland Wash, enclosed by a low granite cliffs and boulders, before descending to the streamway, where shallow pools persist into early summer. The hillsides to the north are lined with many saguaro, growing particularly densely in some places. The path follows the wash downstream, crossing it three times, and arrives back at the parking area.